Maureen lives in Kilmore, North of Melbourne Victoria. Maureen commenced oil painting lessons for two years with local artist Pauline Cross in 1987 at the Living and Learning Centre in Eltham. She had lived in the area for approximately 30 years. She moved on to take lessons in oil for 1 year with another local artist, Noella Clohesy at the Diamond Valley Arts Society. 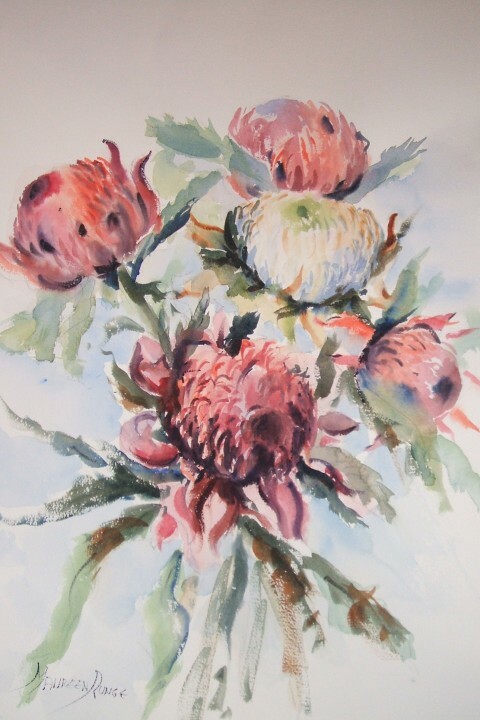 She didn’t enjoy the medium so further instruction followed comprising two terms of watercolour experience with well known Australian Artist Herman Pekel and two years with Giselle Bolitin Maynard. Maureen is mainly self taught in the wet on wet style which she finds exciting and challenging. Maureen loves a challenge and loves to paint figures, flowers, boats, landscapes, seascapes, buildings and native birds. She also enjoys portraiture using pastels. She exhibits locally and is well known for her loose spontaneous style. Maureen has received training from Noella Clohesy at the Diamond Valley Arts Society, and also from well known Australian Artists, Herman Pekel and Giselle Bolitin Maynard. Her paintings are in collections in Germany, England and the United States. First at St. Francis Xavier Montmorency Watercolour. Second Heidelberg Arts Society Watercolour. Second Slovenian Art Exhibition 1993 – Watercolour. Second Northern Region Art and Craft – Watercolour. Best Watercolour Diamond Valley Arts Society 1997. First Diamond Valley Arts Society Watercolour 1999. Highly commended 4x5 - Watercolour. Best Watercolour Banyule Heritage Tom Roberts Award. Best Watercolour Diamond Valley Artists Society 2005. Best Pastel Diamond Valley Arts Society 2005. Highly Commended Watercolour Yarrambat Primary Art show 2005. Highly commended Watercolour Loyola College Art show 2007. Acquired painting by Bendigo Easter Rotary Art Show and then raffled off proceeds to local charities. Best Watercolour - Kalkallo 2010. Best painting in Kilmore Agricultural Show 2010. People’s choice award Kilmore Art Show 2010. Best Watercolour - Kalkallo 2011. Best local content - Kalkallo 2011. Best Watercolour - Heathcote 2011. Best local content - Kalkallo 2012. Maureen has taught watercolour to children and adults at the Diamond Valley Arts Society for a number of years. Maureen now teaches watercolour at home in all subjects. Maureen has run workshops with the Echuca, Plenty Valley Arts, Heathcote, Seymour Art Society, Diamond Valley and Kilmore Art Societies.